A Post Where I Sound Like A Grandmother But Don’t Care. I don’t get kids fashion today. Don’t get it. We all know about the pants thing. Pull up your pants, son. I don’t need to see your underwear. Anyway, the latest fashion trend that’s making me crazy (crazier?) today is the baseball hat thing. Whatever happened to the cute kid in the worn baseball cap positioned straight on his head? The kid with the nicely bent brim that framed their cute face perfectly? 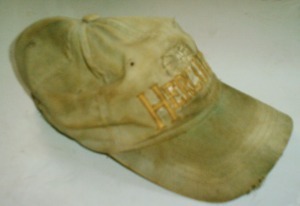 There’s really not much better than a well-worn, well-shaped, well-loved baseball hat. 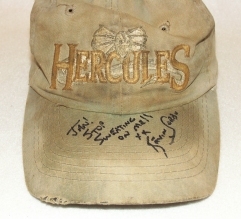 This one belonged to some freaky Kevin Sorbo-obsessed Hercules fan. Anyway, despite his questionable obsession with all things Kevin Sorbo, I actually have more respect for that baseball hat-wearing guy than I do for this guy. Um, yeah, peace out, dude. Now, put your hat on straight. …and no one bends their brims. But, you want to know what’s even lamer? Do you know it’s considered cool today to leave the stickers and price tag on your hat? I kid you not. I’m glad someone pointed out to me today that this was a new trend. Because I would totally go up to that kid and, thinking I was being helpful, reach up and remove the sticker. 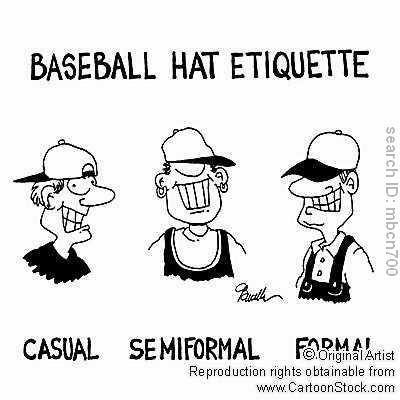 I actually think that baseball hats reflect the slow disintegration of our society today. I love a man in a good baseball cap. — A well-worn baseball cap shows me that its wearer has loyalty. He doesn’t toss the old hat aside because it’s aging a little. A good man appreciates the memories formed when man and hat were each a little younger. And, he looks forward to making new memories together. — A baseball cap positioned straight on the head shows the man has a serious side. No adolescent hijinks here. He’s got nothing to prove. — And, price tags? Name brand labels? I think not. Peel ’em off. A tag-less hat shows confidence. No need to brag. So, I may be the lamest Mom in the world, but I’m bending brims, removing stickers and placing my boys’ hats on straight. Hopefully, they won’t get beaten up on the playground. I agree. ‘Nuff said. I love how the bill represents disintegration of society. Just read a blog about college students asking for permission to turn a paper in over a week late after the teacher had already offered to let them turn it in 3 times late, but the student failed to show. What is happening to this world? What about consequences for poor decisions? And don’t you love how “nuff said” really meant I was going to ramble on? Hahaha, Andi. Yes! Hence your appropriately named blog! Lookin like a fool with your hat all crooked! 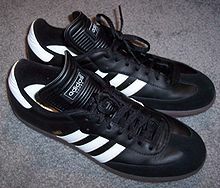 I still think Sambas are cool. Agreed. You look like a turd buddy. I have never seen the price tag trend though. When you first said it I thought of Minnie Pearl. If they only knew an old, country woman has been-there-done-that. ah yes…the boxers and the sambas…we called them “indoors” i guess for indoor soccer…thanks for taking me down memory lane…..we thought we were so cool, along with our big hair.